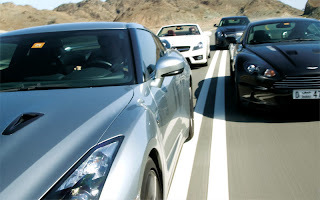 Car Middle East pitted a Nissan GT-R vs an Aston Martin DBS , Cadillac CTS-V , and a Mercedes SL63. Interesting combination of cars to put together. Car drives them though from Jebel Ali over the Kalba Road. Overall they liked the car. So all four contenders can stop, go and turn with varying degrees of sophistication. But they all feel very different to drive. The Cadillac is the brawniest and hairiest of the bunch – you have to put your trust in physics and the engineering of rear-driving boats to make the most of it. But, for me, it was the most difficult to get into the groove of and drive fast. I learnt to put more and more trust in the GT-R, resulting in me travelling through the mountains at higher and higher speeds. At times, I just couldn’t believe the numbers on the speedometer. I’ve never found myself so at ease with a car so quickly. But that’s not to say it’s to everyone’s tastes, editorial director Shahzad found it to be an impressive car, but it scared him. In fact, the GT-R caused him to drop his usual mild-mannered demeanour and turn him into a bit of a potty mouth. You can read more of his thoughts on the website. But for me, nothing came anywhere near close to the all-round abilities of the GT-R. It’s one of the most complete cars around. To me, it looks absolutely mega in its Manga-esque styling, and though I could forgo the central graphical display for some proper dials and gauges, I can’t fault it. The GT-R was created by Nissan with the mantra of ‘21st-century supercar’ in mind. That it is, and so much more. A true modern great.